Windows Live Essentials wave 4 is the next version of Windows Live bundle of free application programs from Microsoft, which includes the popular Windows Live Messenger (aka MSN Messenger). Windows Live Essentials wave 4 has been in the making (development) for a while, and in fact been released to internal staffs for review. And now, there is leaked early build of Windows Live Essentials wave 4, for the dare souls to download and install. The Windows Live Essentials wave 4 that got leaked to Internet is of milestone 2 (M2), and has the build version number of 15.2.2585.0122. Note that it’s not the latest build, as the currently build version compiled by Microsoft has already known to reach version 15.3.2659.319, which is likely to be milestone 3 (M3). 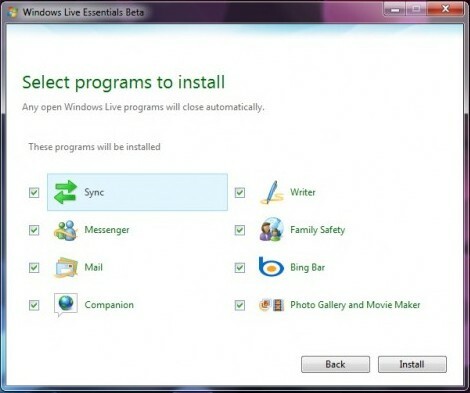 Most applications of Windows Live Essentials are been included and updated, including Windows Live Mail, Windows Live Writer, Windows Live Photo Gallery and Movie Maker, Windows Live Sync, Windows Live Companion, Windows Live Family Safety, Bing Bar, and of course, Windows Live Messenger (WLM) version 2010. We can’t sign you in to Windows Live Messenger. You don’t have permission to log into this version of Windows Live Messenger. Hacker has managed to come out with a patch that replaces the the installed Windows Live Messenger 2010 pre-Beta M2 version with a patched executable with necessary offset replaced, so that the restriction or blockage of sign in to Windows Live Messenger network is lifted and unlocked. The patch is originally meant for Windows Live Messenger 2009 or 2010 build 15.2.2583.119, but it works on latest leak of build 15.2.2585.0122 and possible all future leaked builds with blocked sign-in too. User who interested can download the leaked Windows Live Essentials pre-beta (milestone 2) build 15.2.2585.0122, together with the sign in deny auto-patcher. Do note that the program is not officially supported, and is buggy or may cause problem to your system. According to Windows Live 2010 (WL2010) roadmap, a public beta release of Windows Live Essentials will be made available somewhere in May or June. Here’s the brief timeline indication of the development.